Plants lack the ability to hear the sound as humans and most animals do. Plants are relatively simple organisms that use the light energy to conduct a photochemical reaction involving water and carbon dioxide. This chemical reaction known as photosynthesis produces a variety of simple and compound sugars such as starch and cellulose that form the body of the plant. Plants also lack the ability to comprehend, analyze and think because they don't have a brain. Although plants cannot hear and understand music, many (mostly students in different grades) have studied the effects of music on plants. To go one step further, some people talk to their plants and believe that talking will promote growth and health in plants. Is it possible that sound and music have any affects on plants? In this project you will investigate to determine how different types of music affect plant growth. Experiments require construction of multiple growth chambers or greenhouses that are sound proof. 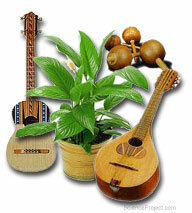 You must grow plants under different music conditions and compare their growth rate. More details or support on this project is available for the members of ScienceProject.com. Materials needed for experiments can be found locally in most areas.